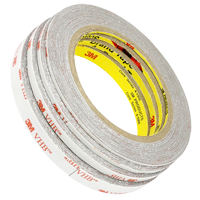 3M VHB RP16 3mm x 0.4mm x 10m (gray) mounting tape made of very durable acrylic polymer, is characterized by its high capacity of absorbing dynamic energy loads and stress relaxation, making it strong and durable. connection. The 4919F, 4929, RP29 series VHB tape models have the ability to adjust to unevenness, which allows for rigid and unmatched elements and irregular surfaces to be glued. Tapes in this group are characterized by excellent adhesion to many plastics, coatings, glass and metals. Resistant to plasticizers. Ideally suited for repair and assembly of frames, touches, LCDs and enclosures of phones and tablets. Place the tape on a clean and dry, properly prepared surface, press (eg roller) the tape to the glued surface, connect the components and press again. The tape can be trimmed to the shape and size of the glued surface, resulting in a clear, smooth, invisible connection.